MOBILITY TO GO ANYWHERE ON EARTH-AND BEYOND! For 50 years, ARGO has been on a quest to build the ultimate vehicle for the world's most challenging terrain conditions. 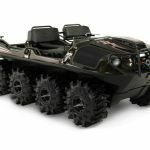 From wilderness recreation to lunar space exploration, our ground-breaking innovations have made ARGO the most successful amphibious Xtreme Terrain Vehicle (XTV) in world. At Prairie Sports & Argo we offer brand new Argos and normally carry about $100,000 dollars in inventory! We also carry the best tracks in the world that are manufactured right here in Wisconsin that will get you in and out of the most extreme terrain. SPORTSMAN'S CONDO - More Bucks, Bigger Bucks, Better Bucks! With a Sportsman's Condo, neither rain, nor snow, nor slicing arctic winds can keep you from maximizing your time in the field. This one-piece modern hunting fortress has no seams to leak, rattle, rust or rot. For the hunter who is serious about spending more time in the field and increasing his chances of spotting that trophy, the Sportsman's Condo is simply a "must have." 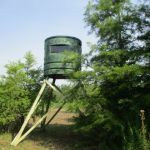 Prairie Sports & Argo offers delivery and setup of enclosed hunting blinds in Northern Illinois, Wisconsin, and the Upper Peninsula of Michigan. We are a fully insured company, so as a land owner you can have peace of mind that all of our installers are covered with no worries about any liabilities. We can set these blinds up just about anywhere with our amphibious XTV's. From swamps to the woods we have you covered. When we are done you just have to show up and hunt, everything is done!